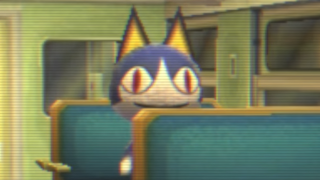 The Animal Crossing series is known for two things: letting you have adorable, anthropomorphic animals as your neighbors, and one of the most predatory loans in all of video games. So it's jarring (to say the least) when fans use the universe as their setting for a '40s style mystery drama. Sorry, did I say "jarring"? I meant "surprisingly captivating." Behold: Animal Crossing Noir. The series, created by Andy Robertson and the Radio Theatre Workshop, will run for 10 episodes and be published over the following weeks. We're up to episode 6 right now, and the tension is palpable. Isabelle knows more than she's letting on, and the townsfolk seem determined to keep the narrator imprisoned within their blissful little village. It's a little like "Children of the Corn meets Misery, by way of Humphrey Bogart" in my opinion, and if that's unclear at all, let me rephase: This is some good stuff. I especially love the presentation. Skillfully voiced, and the still images with fake scan lines help sell the old-timey feel. You can check out the full playlist here.